Mega Sale! 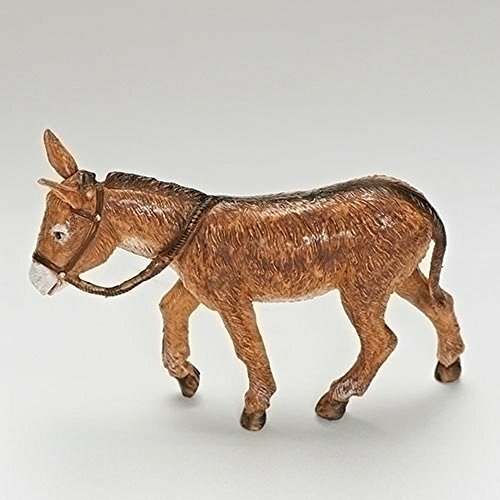 Save 26% on the Fontanini The Donkey Cross by Fontanini at Two Clock. MPN: 54085. Hurry! Limited time offer. Offer valid only while supplies last. . The Donkey's Cross Figurine. Part of the 5 inch scale Fontanini Nativity Village. Made in Bagni di Lucca, Italy. Made from hand painted polymer. View More In Nativity - Page 9.
. The Donkey's Cross Figurine. Part of the 5 inch scale Fontanini Nativity Village. Made in Bagni di Lucca, Italy. Made from hand painted polymer. Approximately 3.25 inches tall (8cm). Includes original manufacturers box and packaging. Made by Fontanini. A little donkey led by Joseph carried Mary, heavy with child to a stable in Bethlehem where she could be safe and warm for the birth of the baby Jesus. It was there that this little donkey first saw a bright-eyed baby looking at a new world. That evening Joseph had a dream that foretold of danger for his newborn son and asked the donkey to again carry Mary and the new baby Jesus into Egypt providing protection for this chosen one. Many year later Jesus disciples asked this same donkey to carry Jesus into Jerusalem where the humble beast of burden was witness to the glory of the people praising their Lord Jesus Christ and the people's Hosannas greeted them as they rode into the city. Little did he know the tragedy that was to befall Jesus.. When grazing one day the little donkey now very old saw Jesus carrying a heavy wooden cross up the hill at Calvary. The faithful donkey wished that he had been able to carry the cross for Jesus. It was more than he could bear the old donkey turned his back on the scene but because of his love for Jesus he would not leave until all was over. As a reward for the loyal and humble love of the little donkey from the birth of Jesus until his death God cause the shadow of the cross to fall across his back and left it there forever as sign that the love of God no matter how humble carries a reward for all to see.